Phnom Penh (VNA) – Cambodia needs to learn from the valuable experience shared by the Vietnamese Party and Government in the implementation of policies towards ethnic minorities, said Chheang Vun, head of the Cambodian National Assembly’s Commission for External Affairs, International Cooperation, Information and Media. He made the statement on July 1 when receiving a visiting delegation from the Vietnamese National Assembly’s Council for Ethnic Affairs, led by its Chairman Ha Ngoc Chien. 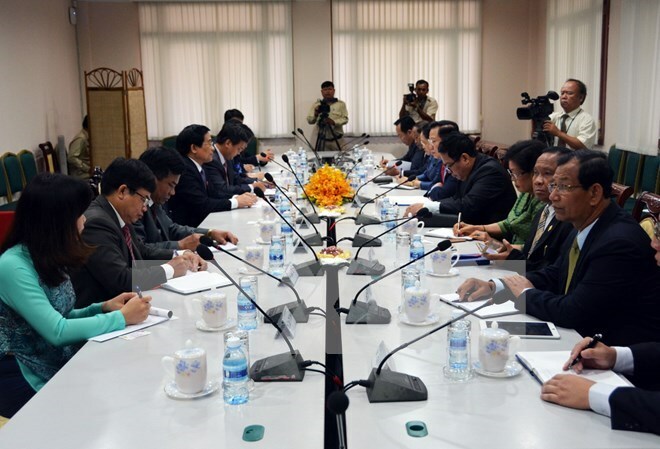 At the meeting, both sides exchanged information on their current affairs and policies related to ethnic minorities. Chien said Vietnam pays heed to improving the ethnic communities’ living standards and helping them preserve their traditions and cultural identities. Chheang Vun lauded ethnic policies implemented by Vietnam and their outcomes, saying that they should be disseminated among relevant Cambodian agencies. The Cambodian official congratulated Vietnam on the successful 12th Party Congress and 14th National Assembly election. He said he believes in stronger and more effective engagements between the Vietnamese and Cambodian legislatures.